Feltwell is a large parish in the southwest corner of Norfolk, on the border with Cambridgeshire. The parish covers 5376 ha, 65% of which is fen, now mostly used for arable farming. The village of Feltwell is about 1km from the fen, with RAF Feltwell on its southern edge. Feltwell Anchor, now commonly called Brandon Bank, is a smaller village in the fen on the banks of the present course of the little Ouse River and Shrubhill is a cluster of buildings on a small terraced gravel island that once stood slightly above the fen. The buildings and gravel extraction from this island now makes it difficult to identify it above the surrounding peat. Similar small rises and islands of river terrace gravels can be seen above the peat in various areas in the Feltwell Fens. Modern farms are scattered through the parish although the majority of the population is centred in Feltwell village and occupation of the fen remains relatively sparse. The earliest historical reference to Feltwell is in the Ely Charter issued around 1030. Feltwell also has a complicated entry in the Domesday Book written in 1086. The name derives from Old English and means 'spring where the felte plant grows'. Felte may be a type of plant similar to the modern mullein. The name seems apt considering the location of the village at the head of a small valley where a small stream empties from the chalk plateau into the fens. Although the earliest historical evidence for activity in the area dates to AD 1060 the unusual amount of archaeological research in the area has enabled us to build up a more complete picture of how the shifting landscape was used in the past. Local archaeologists, historians and collectors conducted fieldwalking and excavations during the middle of the 20th century notable 'Pip' Orange and Frank Curtis. This research revealed much about prehistoric and Roman Feltwell. Parts of their collections and records, particularly relating to the Neolithic period, were collated by Dr Frances Healy (NAU) during her doctoral research. In addition the majority of the parish has been fieldwalked during the Fenland Survey, and several excavations and evaluations have been carried out as part of the Fenland Management Project. The scale of these works and the size of the parish explains the large number of archaeological records. These records enable us to understand more about this complex and interesting landscape. The earliest evidence is from the Palaeolithic period. Over 200 Palaeolithic handaxes (NHER 5292) and a Palaeolithic flake implement (NHER 39472) have been recovered from the gravel pits at Shrubhill. Other Palaeolithic finds have been made at Whiteplot Farm on the fen edge. Near here an Upper Palaeolithic blade (NHER 20979) and two Upper Palaeolithic flint scrapers (NHER 21137) have been recovered. Palaeolithic activity was not confined to the islands and fen edge however, and further finds of two Palaeolithic flint points (NHER 28605) and a further fifteen Palaeolithic handaxes and two flakes (NHER 32957) have been found further up the chalk scarp in the east of the parish. These finds suggest that this was an area of much human activity even in the earliest periods of prehistory. Pollen analysis carried out during the Fenland Survey indicates that during the Mesolithic period prior to the development of peat in Feltwell Fens lime was the predominant tree. The wooded landscape also included hazel, alder and oak trees. Streams flowed gently through the woods and it is possible that their watercourses may be preserved beneath the peat although none have yet been recorded. The Fenland Survey has recovered no evidence for well-defined lithic sites dating to the Mesolithic, although there are over twenty records in the NHER for Mesolithic worked flints. These worked flints included microliths (NHER 4895), an arrowhead (NHER 5255), blades (NHER 5272), two pebble maceheads (NHER 13321 and 13322) and tranchet axeheads (NHER 14632). These finds are mostly concentrated on the edge of the fen with possibly significant concentrations to the west of Whiteplot Farm, on the northern lip of the spur of chalk along which Kettle Lane runs and in the mouth of Feltwell valley. Although these concentrations are not dense enough to imply settled occupation they do indicate zones of increased activity. During the Early Neolithic period these foci of activity began to spread. Scatters of Neolithic worked flints have been found on Kettle Lane Spur, near Whiteplot Farm and in the mouth of the Feltwell valley. Other sites spread along previously unoccupied areas of the fen edge creating an impression of gradually expanding occupation along the length of the edge of the upland area. Worked flints such as Neolithic axeheads (NHER 5293), arrowheads (NHER 14599), blades (NHER 33738) and fabricators (NHER 5211) used for creating sparks and lighting fires are typical finds at these sites. Debitage, waste bits of flint made whilst working a tool, such as flakes (NHER 33324) and cores (NHER 30004) have also been recovered. Neolithic pottery (NHER 21427) has also been found, especially on the fen edge where the delicate ceramics are protected by a layer of peat. Further up the chalk slope it can be difficult to identify scatters of worked flint indicative of occupation. This is because centuries of ploughing have broken through the peat, spreading the worked flints much more thinly across the landscape and damaging fragile pottery. There are no traces of Early Neolithic activity on the gravel islands in the fen nearer to the present course of the Little Ouse. Activity in this area must have been slight or non-existent. During the Late Neolithic the environment of the Fens changed quite dramatically. The western part of the parish was encroached by the sea and became submerged. Salt marsh and intertidal flats developed. Despite these changes activity remained concentrated on the fen edge. By this period sites were fairly evenly distributed. A large occupation site developed at the mouth of the Feltwell valley (NHER 5197). The lack of worked flints away from the edge of the chalk scarp emphasises this use of the boundary between the different environmental zones. The fen was an important resource. By locating their settlement along its edge people living in the area could hunt and fish there whilst living on slightly more secure land less liable to flooding. The absence of large Late Neolithic flint scatters on the gravel islands suggests that although these were visible above the level of the fen they may have only been used for hunting trips rather than permanent settlement. At least 110 scatters of prehistoric burnt flints (or pot boilers) (NHER 19888) have been identified from the parish. These are found where fires have been lit and flints heated and then put into pots to cook the contents. This technique of cooking could have been used on hunting trips or in seasonal camps as well as permanent settlements and therefore these scatters do not always indicate the presence of occupation. This technique of cooking was used throughout the prehistoric period and therefore they are very difficult to date. In four places these concentrations of burnt flints form small ‘burnt mounds’. Excavations of one of these burnt mounds (NHER 23650) demonstrated that this heap of burnt flint and charcoal was built in the Early Bronze Age. Underneath the mound a series of small pits were excavated and beside the mound was a rather larger pit. This was waterlogged and inside it was found a wooden trough dated to the Late Neolithic period. Inside the top of the burnt mound was an Early Bronze Age burial. The body was in a crouched position and was buried with a flint scraper. Other possible Bronze Age burial places have been recorded in the parish. 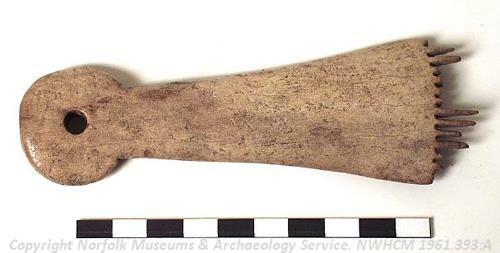 A Beaker period cremation and inhumation cemetery (NHER 5188) was excavated in the 1960s. Seventeen burials were recorded. Several cremations were contained within vessels and one inhumation was that of a child. Analysis of aerial photographs has identified many possible Bronze Age ring ditches (NHER 12156). These are possibly the remains of bronze Age round barrows which were used to memorialise the dead. A group of three barrows (NHER 12797) near the Methwold boundary are marked on old maps and may have been used in the past as boundary markers. Most of these sites are found on the chalk overlooking the fens although one unusual ring ditch (NHER 23650) is located in the fen itself. In addition to these large monuments scatters of Bronze Age finds have also been recorded all along the fen edge. Bronze Age axeheads (NHER 2589), rapiers (NHER 4918), swords (NHER 5263), palstaves (NHER 4920) and daggers (NHER 5163) have been found by metal detectorists. In addition to these single finds two Late Bronze Age hoards have been recovered and a Bronze Age cauldron containing a copper alloy flesh hook (NHER 5191) was also excavated. The first of the Late Bronze Age hoards (NHER 5295) to be discovered was found before 1907. This impressive collection of twenty-one items included copper alloy spearheads, palstaves and sword fragments, gold leaf from an ornament, amber beads and two boar tusks. A small ‘cake’ of copper alloy suggests the items may have been collected together by a metal worker and buried for safekeeping. The same interpretation has been suggested for the other Bronze Age hoard (NHER 5169) found in the parish that also included many copper alloy items and metal working waste. These hoards are part of a much larger group that have been identified across Britain where copper alloy objects and metal working debris are deposited in wet and waterlogged areas. Some archaeologists think that these were buried by metal workers who intended to return to collect their raw materials. Others suggest they were buried as gifts to the gods. If this is the case then the other single finds from the fen edge may also be smaller ritual deposits. As well as metal items these include parts of a Bronze Age bone necklace (NHER 5296) and a rare amber bead (NHER 30008). Early Iron Age structures (NHER 5188) indicated by packed chalk floors were also excavated in the 1960s west of modern Feltwell village. Many Iron Age objects were recovered including fragments of pottery, complete vessels, animal bones and a bone weaving comb. Later fieldwalking here as part of the Fenland Survey recovered Iron Age pottery and prehistoric flints and identified several areas of dark soil which might be the location of other buildings. A third occupation site north of Kettle Lane was identified from a discrete scatter of Iron Age pottery fragments, bones and burnt flints (NHER 5213). These three settlement sites are indicative of a fen edge concentration of activity but a site identified slightly further to the east on the chalk scarp has been identified as a small Iron Age farmstead (NHER 4923). Other chalk sites may also exist but have not yet been identified. The evidence collected suggests that in the Iron Age settlement was regularly spaced along the fen edge and further up the chalk hillside. The complete landscape was utilised. The spur of land around which Kettle Lane travels seems to have been a favoured location with settlements located on the north and south slopes but an absence of evidence for activity on the top of the spur. The location of Roman settlement seems relatively unchanged from the Iron Age. Roman buildings, including two villas excavated in the 1960s, are located at regular intervals along the fen edge, except at Kettle Lane chalk spur that seems to have been a centre of activity. Recorded Roman buildings on the fen edge include one at Whiteplot Farm (NHER 21137), Little Oulsham villa and bath house (NHER 5205) and a building destroyed by the Cut Off Channel (NHER 5210). Some of these have been excavated whilst scatters of pottery, building material and bone fragments have identified others. Activity is not only related to the edge of the chalk scarp, and the discovery of the Glebe Farm Roman villa and bath house (NHER 4921) with its complex under floor heating system demonstrates that settlement was also located further away from the fen. The level of luxury and decadence within the structure illustrates that this was not a Roman backwater but a thriving and quite wealthy settlement. This wealth may have been based on agriculture – fragments of Roman pottery (NHER 22060) have been recovered from many surrounding fields suggesting these may have been manured to increase productivity at this time. 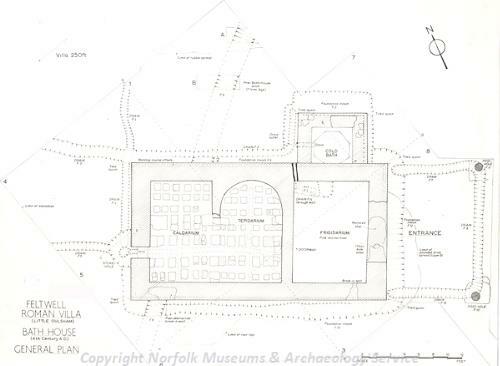 A watercolour receonstruction of Feltwell Roman bath house. Despite the wealth of information gathered about Feltwell during the prehistoric and Roman periods there is surprisingly little evidence for Saxon activity in the area. The German type Early Saxon sword (NHER 5205) from the hypocaust of the Little Oulsham villa and a copper alloy cruciform Early Saxon brooch (NHER 5214) are the only clearly dated Saxon finds. A possible Saxon loomweight (NHER 5216) and shield (NHER 5179) are not clearly dated. A spindle whorl (NHER 5272) and bone comb (NHER 5197) recovered in the parish and interpreted as Saxon could both be Roman. The Fossditch (NHER 1089), an Early Saxon (or Iron Age) linear earthwork running north to south between the River Wissey and the Little Ouse, is a probable line of defence controlling a particular territory. Apart from this boundary line nothing is known of the settlement pattern and landscape at this time. Perhaps Saxon Feltwell remains beneath the modern village awaiting discovery. During the medieval period there is evidence for a change in the way the fen resources were utilised. Previously they had been exploited by small farmsteads and settlements on the fen edge. During the medieval period they were increasingly exploited from a distance. At some point during this period the fens began to be drained and old maps of the area demonstrate that this was relatively complete by the early 19th century. The course of the Little Ouse was altered (NHER 29184), perhaps as part of this scheme, in the medieval period. The medieval parish was large enough to warrant two churches – St Mary’s (NHER 4940) built in the 15th century after a fire in an older church on the same site and St Nicholas’ (NHER 4939) that is mainly Norman in date with a 13th southern arcade. The latter was declared redundant in 1976. A medieval cross (NHER 4938) was also erected at the crossroads in the east of the village. A 13th to 14th century moated manor and deserted settlement (NHER 4925) were excavated in the west of the village before the site was redeveloped for housing. 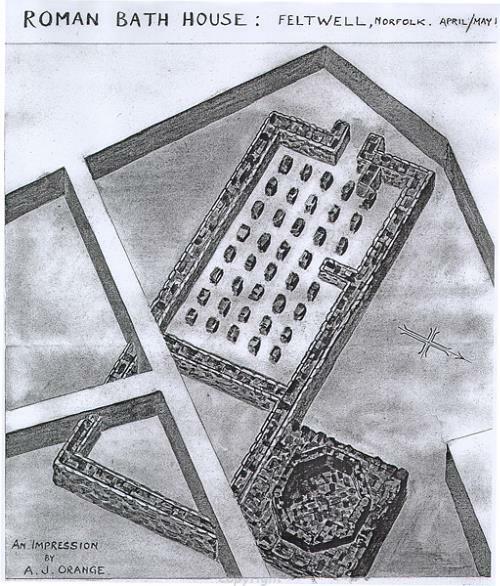 Possible medieval fishponds (NHER 24981) may have been linked to this complex. Historical records suggest the fen was divided between the fen edge parishes and was used as common land. During the post medieval period extensive draining of the fens continued. The sites of many old wind pumps (NHER 16041) are marked on old maps. Whilst most of these have now been demolished some have been replaced by modern pump houses (NHER 5446) that continue the original drainage function of the earlier structures. Several post medieval windmills (NHER 16208) have also been recorded in the parish. At one site an unusual circular sail post mill was replaced by a tower mill (NHER 16209). In the event of unruly behaviour or drunkenness in Feltwell in the post medieval period the perpetrator would be locked into the pound (NHER 16601). Although these buildings were generally used for housing stray animals they are recorded as being used in other towns for the same purpose. The Shrubhill tramway (NHER 18827) served a brickworks at Shrubhill and several osier beds. It was in use by 1867 and closed in the 1880s. As the fens were increasingly used for agriculture the Feltwell and Southery Farming Company Railway (NHER 18619) was laid in the fens connecting to Wissington Railway. It served a large farming estate in the area and was in use between 1928 and 1957. The two World Wars had a lasting impact on Feltwell. RAF Feltwell (NHER 4942) was used in both and continued in use until the 1960s. An additional satellite World War Two airfield (NHER 4937) connected to RAF Feltwell was built in 1939 and was in use until 1945. A World War Two gun emplacement and pillbox (NHER 16868) and another pillbox (NHER 32686) defended the main base. Despite the relatively rural nature of the parish the proximity of the RAF base and airfield meant there was some likelihood of bombing. An air raid shelter (NHER 40825) was discovered in the village when foundations for a new house were dug. A Lancaster aircraft on a training flight from RAF Mildenhall crashed in the parish in 1944. The crash site (NHER 18622) has since been excavated by the Anglian Aeronautical Preservation Society. After the two World Wars RAF Feltwell was used as a training base first by the RAF and later by the Women’s Auxiliary Air Force (WAAF). After the RAF gave up the site it became a satellite of the United States Army Air Force site at Lakenheath and is now the Deep Space Tracking Station. The large ‘golf balls’ on the site can be seen from long distances. Until recently a Cold War Thor missile launching site (NHER 41288) was located on the base. Megan Dennis (NLA), 1 December 2005.
http://spamandchips.net/archaeology/index.htm. Accessed 22 February 2006.
http://www.roll-of-honour.com/Norfolk/Feltwell.html. Accessed 22 February 2006.
http://www.eng-h.gov.uk/archrev/rev96_7/fenmp.htm. Accessed 22 February 2006.
http://www.feltwell.net/. Accessed 23 November 2011.
http://www.norfolkmills.co.uk/Windmills/feltwell-towermill.html. Accessed 22 February 2006.